We’d love your help. Let us know what’s wrong with this preview of The Paradise War by Stephen R. Lawhead. The ancient Celts admitted no separation between this world and t From the dreaming spires of Oxford, Lewis Gillies drives north to seek a mythical creature in a misty glen in Scotland. Expecting little more than a weekend diversion, Lewis finds himself in a mystical place where two worlds meet, in the time-between-times - and in the heart of a battle between good and evil. To ask other readers questions about The Paradise War, please sign up. how Christian is this book? are the pagan Celts villainized? I absolutely LOVED the first part that took place in modern Oxford and Scotland, but actually wasn't that into the second part that crossed into the Otherworld. I think this is the first time I've ever said that I wish the beginning could have been dragged out for most of the book... and that the characters had just stayed in the modern world. Lewis is an American grad student at Oxford who's had to work really hard for everything he has, while his wealthy friend Simon has been freely given ever I absolutely LOVED the first part that took place in modern Oxford and Scotland, but actually wasn't that into the second part that crossed into the Otherworld. I think this is the first time I've ever said that I wish the beginning could have been dragged out for most of the book... and that the characters had just stayed in the modern world. Lewis is an American grad student at Oxford who's had to work really hard for everything he has, while his wealthy friend Simon has been freely given everything he ever wanted. Simon starts acting suspicious one day around Samhain and makes them drive to Scotland, where he randomly crawls into a remote cairn. He disappears into a portal to the Otherworld, but Lewis thinks he's just playing a joke on him. Time passes differently in the Otherworld, so Simon's been there for six years by the time Lewis goes to a professor, pieces everything together, and manages to get through the portal himself. There were SO many cool ideas in the first 100 pages of the story and I was so sure I had found a new favorite book, but things kind of went downhill when both guys arrived in the Otherworld. It was just a lot of bloody battles, confusion, and training for years. I liked the ideas of Albion, Scatha, Prydain, and general parts of Celtic history and mythology I recognized! But it did seem a little odd that Lewis would be a Celtic Studies grad student at Oxford and know so little about his own field. I get that it's a way to fill the reader in on basic facts and that Lewis even admitted the "appalling shallowness" of his education, buuut it was still weird. My favorite scenes were the casual ones of them driving around the British countryside while listening to classical music and debating random topics. This book was published over 25 years ago, so it was fun to get a glimpse into the academic world of that time period. As an avid fantasy reader, I was reluctant to try this trilogy because Lawhead is not one of the best known fantasy writers. My husband bought me the book because Lawhead is a Christian and he thought I should try it. I was very pleasantly surprised! The writing is excellent. The story is interesting, meaningful, and epic in scope while still progressing rapidly enough to finish in three books. It contains all of the elements I look for in a fantasy: vivid d ORIGINALLY POSTED AT Fantasy Literature. It contains all of the elements I look for in a fantasy: vivid description, many interesting and well-developed characters, problems to solve, quests, romance, war, tension, intrigue, and a happy ending. This is the first book of a trilogy; and like Tolkien's Lord of the Rings books (which he originally didn't want to separate into three volumes --that was the publisher's idea), the Song of Albion books basically form a unit that should be read and considered together. An evangelical, Lawhead displays the influence of C. S. Lewis in places in his writing; the Christian symbolism in the last volume, The Endless Knot, is particularly clear. But his fantasy vision is his own, heavily influenced as This is the first book of a trilogy; and like Tolkien's Lord of the Rings books (which he originally didn't want to separate into three volumes --that was the publisher's idea), the Song of Albion books basically form a unit that should be read and considered together. An evangelical, Lawhead displays the influence of C. S. Lewis in places in his writing; the Christian symbolism in the last volume, The Endless Knot, is particularly clear. But his fantasy vision is his own, heavily influenced as well by Celtic mythology (American born, he moved to England to have better facilities for studying Celtic history and culture), and his fantasy world is supposedly the Celtic Otherworld, with a recreated Bronze Age Celtic culture whose elements of primitive monotheism he stresses (more so than they were in actual pagan Celtic society). He makes very creative and original use of different features of Celtic lore, such as the Silver Hand (which provides the title of the second volume), the endless kettle, Beltane fires, etc. So what is The Paradise War? Epic then, epic now, it is one of the first things I remember my mother reading to me when I was young, allowing me to visualize the might and magic of this well-woven portal into Celtic adventure and Otherwordly feats. 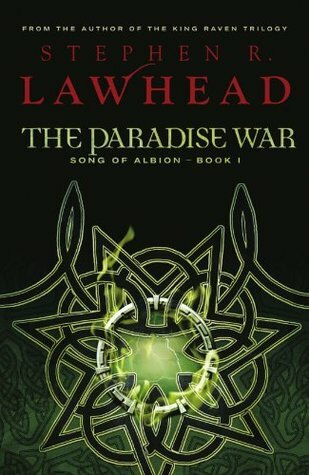 Beleaguered by the shift from Oxford academia and the more intellectual-style of prose such dictates, Stephen R. Lawhead's first book in The Song of Albion Trilogy finds its legs firmly rooted in grit and gore and snow and song, reminding me that anyon So what is The Paradise War? Epic then, epic now, it is one of the first things I remember my mother reading to me when I was young, allowing me to visualize the might and magic of this well-woven portal into Celtic adventure and Otherwordly feats. Beleaguered by the shift from Oxford academia and the more intellectual-style of prose such dictates, Stephen R. Lawhead's first book in The Song of Albion Trilogy finds its legs firmly rooted in grit and gore and snow and song, reminding me that anyone can be a true hero so long as they walk the endless knot-maze path buried down in their heart. This being the first time I've read the book since becoming a published author and writing Celtic fantasies of my own, the effect is profound and surreal, if not subtle and subliminal, as The Paradise War thrills those hungry for fantasy's most famous tropes on the surface, but more than that, stirs a sense of longing and belonging deep within, which upon reading, cannot be denied. As the story at its core is an exaltation and an exhortation of the divinity of the arts and the sublime nature of the search for the song and the spirit of song, the essence of life and the music of ancient bloods and other tongues, I cannot help but be moved to tears that such a seed was sown within my own knot-maze path to becoming an author, the effects of which will forever spread like a single sonorous note, or a ripple upon an endless ocean. Such is the way of the fabric writers weave, the books readers read, and the breath humans breathe. Recommended for lovers of classic fantasy. I really liked the first 150 pages or so and thought the last 300 pages were pretty boring. Basically I didn't like the actual portal fantasy section. I think I would enjoy it if Stephen Lawhead wrote a contemporary novel, like a psychological thriller or literary fiction or something along those lines, but this wasn't for me. I had high hopes for this book, and found the story line very intriguing. The Otherworld is leaking into our world and vice versa. Random things are appearing in our world and people are disappearing. How disappointed I was when I cracked into this! There were excessive details where none were needed and not enough detail when I had no clue what was going on. About 40 pages in, I started to think the author hated his main character. Lewis, while smart and learned in Celtic history, seemed to alwa I had high hopes for this book, and found the story line very intriguing. The Otherworld is leaking into our world and vice versa. Random things are appearing in our world and people are disappearing. About 40 pages in, I started to think the author hated his main character. Lewis, while smart and learned in Celtic history, seemed to always be on the outside looking in and really slow on the uptake. He also seemed a little obsessed with his best friend, who, frankly, was an obnoxious character. The writing style seemed very condescending, like the characters are so much smarter than the reader. I just kept waiting for things to be explained in something other than a school-like manner. Solid 4 stars, great read! Can't wait to pick up the next one! Although I truly admire the language and prose Stephen Lawhead uses in his novel, the book totally lacked all elements of a good story. There was no plausible plotline or storyline of events that I could follow. All the events were seamlessly unrelated, random and discordant. There was no greater plot, no quest or manner in which the characters followed. There was no goal, no objective, hardly a conflict or an antagonist to defeat. Lord Nudd who I suppose was supposed to be the "villain" of the Although I truly admire the language and prose Stephen Lawhead uses in his novel, the book totally lacked all elements of a good story. There was no plausible plotline or storyline of events that I could follow. All the events were seamlessly unrelated, random and discordant. There was no greater plot, no quest or manner in which the characters followed. There was no goal, no objective, hardly a conflict or an antagonist to defeat. Lord Nudd who I suppose was supposed to be the "villain" of the story had no character, no purpose, or no goal in what he did. The characters were not developed and the attempts to do so fell a long way off the mark. Many of the characters annoyed me, especially Simon, Tegid, and Meldron (which is pretty much all the characters there were in the book). Their personalities were not defined enough so that their random outbursts and statements made no sense and had no standing. Prince Meldorn who was initially a kind and valiant Prince all of a sudden turned into some sort of usurper and greedy power hungry noble. Simon who was carefree and adventerous suddenly became the instigator of all things evil in Albion. Tegid was a major pessimistic bard who annoyed me with half his attempts of bringer a downer on everything. Lewis' character (or whatever his name is, really) was not developed enough for me to be annoyed at. He had no personality, and after reading 400-something pages I would be hard pressed to find one adjective to describe him. The first in a trilogy, The Paradise War follows the amazing and fantastic adventure of a young college student by the name of Lewis Gillies. When he follows his friend on an sudden and unlikely urge to explore the strange appearance of a long extinct beast in Scotland, he is shocked when his friend disappears inside a cairn and does not return. It is only when he attempts to follow Simon that he understands why. Albion is where he finds himself. It is the Otherworld, and he is thrust into it so The first in a trilogy, The Paradise War follows the amazing and fantastic adventure of a young college student by the name of Lewis Gillies. When he follows his friend on an sudden and unlikely urge to explore the strange appearance of a long extinct beast in Scotland, he is shocked when his friend disappears inside a cairn and does not return. It is only when he attempts to follow Simon that he understands why. Albion is where he finds himself. It is the Otherworld, and he is thrust into it so quickly and violently that he doesn't even have time to protest the series of events that lead to his warrior training and the events that will follow. Lewis is in Albion, a land so steeped in Celtic myth, lore, legend, and culture that the novel resonates with this fantastic framework and thrills the reader with their own discovery of it. Lewis comes to love Albion so well that the thought of returning to the drab, gray, meaningless life that he left behind him makes him sick. How could a person desire to take a shadow of a thing over the reality? He comes to realize, though, that the presence of strangers has brought a new influence in to the ancient ways and traditions of the country, and that it is steadily bringing about the downfall of the world. Simon is a changed man, and his greedy words of dissent whispered into the right ear causes waves that cannot be stopped. Lewis realizes that he must prevent anything else from taking place, and though it grieves his heart, he tries to force Simon back to their own world, only to be met with surprise. This book is my introduction to the works of Stephen Lawhead, and I must say that I am very impressed. He has created a rich and colorful world that so thoroughly held me captive in a way that books have not done for a while. I fell in love with the beautiful descriptions, the wonderful lore that made the skillful foundation for the work, and the very characters themselves caught at my mind and are still clinging there. I personally loved The Paradise War and can't wait to finish the second book in the series, The Silver Hand, although I would probably not recommend the series for younger teens and below. Lewis is an American student going to school in Oxford. When his roomate discovers a newspaper article about a legendary beast (an aurochs) that was sighted, they both go on a weekend adventure to try and see it. What they discover however, is a cairn that transports them into another world-the world of Albion. This book was seriously amazing. I picked it up in the store because the cover caught my eye, but I didn't expect to get swept up in it like I did. It is an amazing fantasy story, with wri Lewis is an American student going to school in Oxford. When his roomate discovers a newspaper article about a legendary beast (an aurochs) that was sighted, they both go on a weekend adventure to try and see it. What they discover however, is a cairn that transports them into another world-the world of Albion. This book was seriously amazing. I picked it up in the store because the cover caught my eye, but I didn't expect to get swept up in it like I did. It is an amazing fantasy story, with writing so beautiful and descriptive I felt almost as if I were in Albion too! I really enjoyed this story and would recommend it to anyone! I prefer fantasy worlds filled with lots of fantastical elements. Magic, talking creatures, elves, dwarves, fairies, etc. In this book, the Otherworld was fairly realistic (at least historically) for most of the story. That was pretty disappointing. The characters were also rather dull. The ending was decent, and some characters are starting to develop a bit. Only four stars because the second is even better. But it needs a long and thought-through review. So, the beginning is way different than the rest of the book. The feeling was different. I liked the first feeling better. Not that the second was bad, it was just really not what I was expecting. But it was a good read and I'm glad I own it and will be happy to dig into the next book really soon. Then there was Simon. I liked Simon in the beginning. But his character was changed sooo much after going into the Otherworld that he wasn't the same person at all. And I guess by the time you saw him it was three years later, but there was no real... realness to why he had become this ruthless, mean person. And I was sad because I thought he would have been fun to read about if he had stayed true to his beginning self. And you don't even see much of his meaner side, he's not in the book that much. A few other random, little things that I found out of place (Lewis's loyalty to a king he really didn't know, it never explaining how Simon knew so much about Celtic lore in the beginning) but overall a very nice read. Three Stars is my perfect rating for this book - no more and no less. It was not by any means a bad book, but was also not something that stood out or grabbed me. While the scenery, history, and lore shines through and is very well written, and I did very much enjoy the vocabulary in this novel, I felt the plot and pace rather systematic and predictable. The depth of most of the characters was mediocre, having a sampling of surface personalities you would find in any medieval story involving a k Three Stars is my perfect rating for this book - no more and no less. It was not by any means a bad book, but was also not something that stood out or grabbed me. While the scenery, history, and lore shines through and is very well written, and I did very much enjoy the vocabulary in this novel, I felt the plot and pace rather systematic and predictable. The depth of most of the characters was mediocre, having a sampling of surface personalities you would find in any medieval story involving a kingdom in peril in the face of evil. I was routinely bored, wanting to get through the bard's long tellings, skimming pages and sections. I didn't even have enough patience to fully read the Song of Albion once it was revealed. It was really only the very beginning that pushed me through the bulk of the book, and the very end (in fact, the very last pages) that might make me read the second. Zzz. Boring! This is only book one of a trilogy, so I guess this book has some excuse for having a LOT of tedious back story, but that doesn't mean I have to like it. It seemed like the entire first 60% of The Paradise War was blah, blah, blah back story. And then. AND THEN. We get to the so-called "good stuff," and still NOTHING HAPPENS. The main character whines some more, his obnoxious and arrogant sidekick goes on and does some more obnoxious and arrogant things. There's a kiss. And then... t Zzz. Boring! This is only book one of a trilogy, so I guess this book has some excuse for having a LOT of tedious back story, but that doesn't mean I have to like it. It seemed like the entire first 60% of The Paradise War was blah, blah, blah back story. And then. AND THEN. We get to the so-called "good stuff," and still NOTHING HAPPENS. The main character whines some more, his obnoxious and arrogant sidekick goes on and does some more obnoxious and arrogant things. There's a kiss. And then... the book is over. A good, easy-to-follow story, well-told, but it didn't quite live up to expectations. The opening scenes included an aurochs and a green giant, then nothing—other than the obligatory portal experiences—really "Other" for 300 pages. Oh, there's lots of "other"--good ancient Celtic words and culture, but little of Fairie. In fact, if there's a flaw to Lawhead's approach is that he treats even his spiritual beings as super strong, super evil, etc., but they lack the "feel" of Other. A quibble. Lawhe A good, easy-to-follow story, well-told, but it didn't quite live up to expectations. The opening scenes included an aurochs and a green giant, then nothing—other than the obligatory portal experiences—really "Other" for 300 pages. Oh, there's lots of "other"--good ancient Celtic words and culture, but little of Fairie. A quibble. Lawhead often tells rather than shows. Often he describes a scene based on his protagonist's emotional response and not what Lewis/Lydd is responding to. This story is based heavily on celtic mythology. The main character knows almost nothing about the celts and has to have everything explained to him. He is a grad student. His major is celtic studies. How does that even make sense!? I didn't end up finishing the book, got about halfway through and skimmed the rest. In the hands of a better writer the story might have been decent. The characters however were too weak and lacking in personality to carry the plot. As it is, if I could have given it This story is based heavily on celtic mythology. The main character knows almost nothing about the celts and has to have everything explained to him. He is a grad student. His major is celtic studies. How does that even make sense!? I didn't end up finishing the book, got about halfway through and skimmed the rest. In the hands of a better writer the story might have been decent. The characters however were too weak and lacking in personality to carry the plot. As it is, if I could have given it zero stars I would have. •Typically I reserve 1 star ratings for books that I loath or gave up on. The only reason I didn't give up on this one was just because I didn't want to give up on another book right now. •My biggest problem with this book was that I was just so bored with it pretty much the entire time I was reading it. I got stuck in the first 40 pages for almost 2 months, at that point I bought the audio book to help push me through it. •It seems, after attempting two different series written by Lawhead, that •Typically I reserve 1 star ratings for books that I loath or gave up on. The only reason I didn't give up on this one was just because I didn't want to give up on another book right now. I haven't read any later works in the series yet. So, I can only comment on this first title directly. I really enjoyed it. Lawhead either did his research on Celtic culture or managed to bluff very convincingly. Personally, I believe it was the former. Still, it was not paradigm altering. It seemed a pretty standard tale of boy goes to mythical "Otherworld", encounters amazing magical adventure and comes back. (Or does he?) it also reminded me a bit of Tolkien and Lewis's works. It certainly se I haven't read any later works in the series yet. So, I can only comment on this first title directly. I really enjoyed it. Lawhead either did his research on Celtic culture or managed to bluff very convincingly. Personally, I believe it was the former. Still, it was not paradigm altering. It seemed a pretty standard tale of boy goes to mythical "Otherworld", encounters amazing magical adventure and comes back. (Or does he?) it also reminded me a bit of Tolkien and Lewis's works. It certainly seemed inspired by them. This is not a bad thing though as the tale is enjoyable. My biggest complaint might be that he sometimes seemed to insert random historical facts about Celtic culture which don't seem necessary to the whole story. A good example from early in the book is the "Green Man". He also never adequately explained the one fact is character seemed to maintain from early in the tale. Namely that Lewis and Simon's presence in the Otherworld was damaging to it. My second biggest complaint is that I don't feel the main character, Lewis, really grows much from a moral standpoint. He talks about him changing as a person and how his physical body changes, but doesn't seem to show growth of character. If Lewis learns anything in the tale, it's the importance of duty in spite of fear and death, but even that seems to be told to the reader more than shown to him. Perhaps this is because the tale is narrated from the first person? My favorite parts of the story dealt with the elaborate lore surrounding Albion, the prophecies, the bards, and the way authority worked in the world of Albion. When authors try to tell of the paradoxical contradictions which make up their fantasy world and manage to convey the tensions which come from these, it makes me happy as a reader. This brings me to one final point. I had been told that this book or maybe the series as a whole is distinctly "Christian". One friend didn't even want to read it because of this. The truth is, after reading this book, I see no evidence for this at all. If Christian themes and philosophies are present, they are presented in a decidedly not distinctly Christian way. The closest I can think of is thee nation of a "creator god" who sits amongst or perhaps at the top of a pantheon of gods. (not a Christian idea) this is a fantasy tale, and I had no problem with this, just as I have no problem with C.S. Lewis being pretty distinctly Christian in his Cosmic Trilogy (those are some of my absolutely favorite books). I felt it merited mention though as some people seem to skip this book and series for that reason. I really really wanted to like this book. I'd read a Stephen Lawhead book about a decade ago, and remembered enjoying it. And this book came with a high recommendation from a friend (5 stars no less!) so I was anticipating a good story, well written. But I couldn't like it. It was dull, dull dull. The two main characters introduced in The beginning pages were irritating and unengaging. The narrative was unbearably slow and pompous. The main protagonist is supposed to be a grad student at Oxford i I really really wanted to like this book. I'd read a Stephen Lawhead book about a decade ago, and remembered enjoying it. And this book came with a high recommendation from a friend (5 stars no less!) so I was anticipating a good story, well written. But I couldn't like it. It was dull, dull dull. The two main characters introduced in The beginning pages were irritating and unengaging. The narrative was unbearably slow and pompous. The main protagonist is supposed to be a grad student at Oxford in Celtic studies, and yet he seems to know less than me! I really tried to persevere. But when you find barely five or six chapters in you are skim reading, skipping whole chunks, and literally having to force yourself to read... Then this is not a book that's working. So yes, I gave up. Maybe if I'd pushed on a bit futher I'd have gotten into it. But I doubt it. The storyline and premise was interesting to begin with: an extinct animal found in Scotland to the delight of a bored, young privileged man at Oxford and then a meeting with the Green Man. However delightful the story may seem, however, the writing must carry it almost singularly, and it certainly did not. There was too much Wilde-esque whinging from the Brit, too much 'meh' and slowness from the Yank and nothing particularly happening. The first part was really cool... and then somehow the fantasy otherworld was really boring. How are these books not even on my list, much less missing from my favourites list? The Song of Albion trilogy is still right up there with the best fantasy I've ever read. It captured my imagination like nothing else I had read before it, and in the same way that Lord of the Rings and Harry Potter managed to (when I read them both years after Lawhead's trilogy). These are three books I generally try to read every year or so. Amazing. Easily Lawhead's best work, although 'Patrick' and 'Byzantium' How are these books not even on my list, much less missing from my favourites list? A lot about this book seemed familiar, which, I suppose is what to expect with fantasy that features the hero's journey. Lewis lives a mundane existence in the manifest world, then slips through a mystical portal to find himself in a world brighter, bolder, and more meaningful then the one he left behind. I don't have to tell you what happens, you already know, and that, I found, was the book's greatest weakness. I seemed to know what was going on long before any of the characters, and this was A lot about this book seemed familiar, which, I suppose is what to expect with fantasy that features the hero's journey. Lewis lives a mundane existence in the manifest world, then slips through a mystical portal to find himself in a world brighter, bolder, and more meaningful then the one he left behind. I don't have to tell you what happens, you already know, and that, I found, was the book's greatest weakness. I seemed to know what was going on long before any of the characters, and this was a little bit frustrating. The book's greatest strength was the prose, which was lovely and worth reading even when I felt a little stifled by the pacing. I have to confess that I liked the beginning and the ending more so than the middle. I found myself skimming through some of the chapters where Lewis trains to become a warrior and tries to fit in with Albion and its way of life. I liked Lawhead's Bright Empire Series better, but according to his Afterword, many fans prefer this series. I'll finish the rest of the trilogy, but I'll probably read a few other books first. Stephen was born in 1950, in Nebraska in the USA. Most of his early life was spent in America where he earned Stephen R. Lawhead is an internationally acclaimed author of mythic history and imaginative fiction. His works include Byzantium, Patrick, and the series The Pendragon Cycle, The Celtic Crusades, and The Song of Albion.